The Film: In 1954, Japan suffered its first monster attack. Godzilla demolished Tokyo, and was eventually killed by Dr. Serizawa’s Oxygen Destroyer. Since then, monsters such as Mothra and Gaira have invaded Japan. Unable to replicate the deadly Oxygen Destroyer, Japan instead developed Maser Cannons to use against these creatures. Akane Yashiro is a Maser Tank operator with Japan’s Anti-Megalosaurus (?!) Force. This team was established to defend the nation against giant monsters. In 1999, another Godzilla comes ashore near Tateyama during a typhoon. The Masers prove ineffective against the monster. While trying to maneuver her Maser on a narrow mountain road, Akane pushes a jeep carrying her commanding officer over a cliff. Godzilla crushes the vehicle, killing the occupants. After the attack, Akane is demoted to a desk job. Meanwhile, the Japanese government scrambles to come up with a way to defeat Godzilla. They approach the greatest scientific experts in the nation with a radical proposal: Create a bio-robot in Godzilla’s own image. While its body will be mechanical, its control system will be a DNA computer programmed with genetic material extracted from the bones of the 1954 Godzilla. Dr. Yuhara, an expert in bio-robotics, agrees to work on the project. His young daughter Sara, who still mourns her mother’s death, is given free run of the facility. The robot (dubbed “Kiryu”) is completed in 2003, and Akane is chosen to pilot it. Kiryu’s ultimate weapon is the Absolute Zero Cannon, which has the power to freeze and disintegrate any target. However, something goes awry when Godzilla reappears and is confronted by Kiryu. 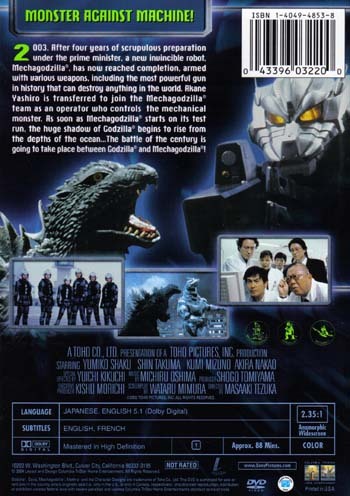 Godzilla’s roar awakens some primal memory within Kiryu and the robot goes berserk! Can it be brought back under control? Even if it can, does this metal doppelganger have the power to rid Japan of Godzilla once and for all? 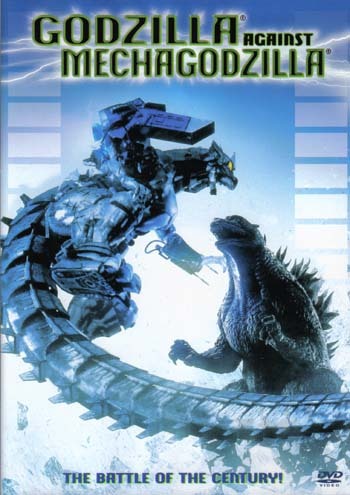 The first twelve minutes of Godzilla Against MechaGodzilla (GxMG for short) are incredible. Godzilla makes a grand entrance, and the Maser battle is reminiscent of the one from War Of The Gargantuas. Then, the history of monsters is detailed by two familiar faces: Kumi Mizuno and Akira Nakao (Miss Namikawa from Monster Zero and General Aso from the Heisei series, here playing the current and future Prime Ministers of Japan respectively). The film is great up until the first monster battle. Then the problems begin, in the form of uneven effects work. While Kiryu (nicknamed “MechaGodzilla” by Sara) may be the best incarnation of the character yet, Godzilla himself leaves something to be desired. This Godzilla design is a reworking of the “Millennium” Godzilla that appeared in Godzilla 2000 and Godzilla vs. Megaguirus. While the color scheme and skin texture on this version look good, the head is too small and overall the suit is very immobile. When Kiryu begins its first assault on Godzilla, Godzilla doesn’t even react. Could Toho only afford to pay one suit actor that day? The final fight has some good moments, again negated by cheesy ones. There are no less than FIVE instances of one of the monsters getting hit or thrown, then being shown flying along with their body parallel to the ground. While director Masaaki Tezuka (GxM) has a better script with deeper characters for his second G-film, he is saddled with poor special-effects direction. On the plus side, there are some great shots, like Godzilla roaring into the rainy night sky as lightning hits his spines, Kiryu standing lifeless at sunset after its rampage, and Akane standing on Kiryu's shoulder. Extras / Menus: The only extras are trailers for other CTHE releases. The trailers are: The Medallion (starring Jackie Chan), Returner (a high-tech Japanese time-travel thriller), the anime Tokyo Godfathers, Tube (an action flick set in a subway), and Vampire Effect. All of the trailers are in widescreen; only The Medallion is anamorphic. The Tube and Vampire Effect trailers also play automatically when the disk first starts up, but they can be skipped. The menus are all anamorphic still images, with no music or sound.